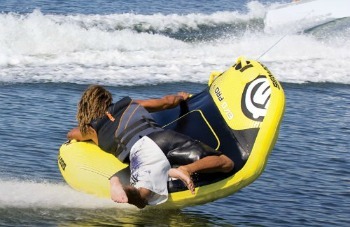 The Sea-Doo EVO PRO 1 Person Towable Tube is built for a one person ride. 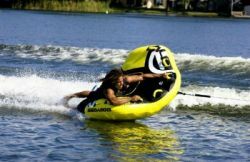 Whether you want to hold on for the ride of your life as you take on ever bigger and badder waves, or try different positions because it is designed for several riding positions. Decides which one works for you. 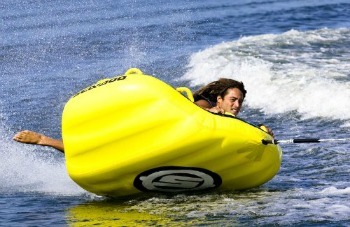 The Sea-Doo EVO PRO 1 Person Towable Tube is going to keep you busy and entertained for the whole summer. The Sea-Doo EVO PRO 1 Person Towable Tube has the added side wings that give you that soaring feeling. This is an awesome ride on the water. 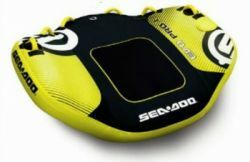 The Sea-Doo EVO PRO 1 Person Towable Tube has the soft foam lower body pad to assure your comfort as you are bouncing across the wake. And of course, the Sea-Doo EVO PRO 1 Person Towable Tube has all the safety features you have to trust from Sea-Doo. This towable tube is designed for your wild ride, being pulled behind the boat with speed and skimming across the waves. A powerful ride that will keep you coming back to the water all summer long.